Captain Michael John, U.S. Navy (ret. ), will deliver the 2017 Gladys Hall Coates University History Lecture on April 12 in the Wilson Special Collections Library. 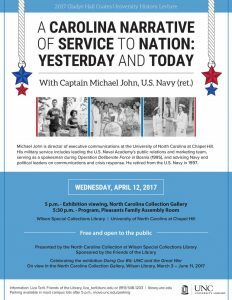 His talk, “A Carolina Narrative of Service to Nation: Yesterday and Today” celebrates the Wilson Special Collections Library exhibition Doing Our Bit: UNC and the Great War. John is director of executive communications at the University of North Carolina at Chapel Hill. His military service includes leading the U.S. Naval Academy’s public relations and marketing team, serving as a spokesman during Operation Deliberate Force in Bosnia (1995), and advising Navy and political leaders on communications and crises response. He retired from the U.S. Navy in 1996. His talk is presented by the North Carolina Collection at Wilson Library and is sponsored by the Friends of the Library. Doing Our Bit: UNC and the Great War will be on view in the North Carolina Collection Gallery of Wilson Library though June 11, 2017. The Gladys Hall Coates University History Lecture honors the late Coates, who was an avid historian of UNC. She and her husband, Albert Coates, founded UNC’s Institute of Government, now the UNC School of Government.